Learn to create a fly-line system that has no knots! 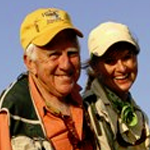 You can make strong, reliable, time-tested connections without bulky knots and loops- the same system that Dave and Emily have used for ALL their fly fishing for over 20 years. Everything you need (except clippers) to create several different knotless connections and line repairs is in the kit. Plus you’ll receive Dave’s instructional DVD to make the entire process even easier. Dave even includes lots of fly-tying tips.